مکاری, مهدی, قهرمان, بیژن, ثنایی نژاد, سیدحسین, علیزاده, امین. (1394). 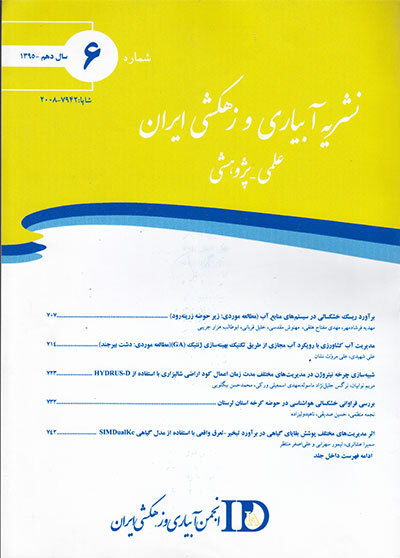 ریز مقیاس کردن زمانی و مکانی تبخیر-تعرق واقعی تصاویر لندست و مودیس. نشریه آبیاری و زهکشی ایران, 9(5), 710-719. مهدی مکاری; بیژن قهرمان; سیدحسین ثنایی نژاد; امین علیزاده. "ریز مقیاس کردن زمانی و مکانی تبخیر-تعرق واقعی تصاویر لندست و مودیس". نشریه آبیاری و زهکشی ایران, 9, 5, 1394, 710-719. مکاری, مهدی, قهرمان, بیژن, ثنایی نژاد, سیدحسین, علیزاده, امین. (1394). 'ریز مقیاس کردن زمانی و مکانی تبخیر-تعرق واقعی تصاویر لندست و مودیس', نشریه آبیاری و زهکشی ایران, 9(5), pp. 710-719. مکاری, مهدی, قهرمان, بیژن, ثنایی نژاد, سیدحسین, علیزاده, امین. ریز مقیاس کردن زمانی و مکانی تبخیر-تعرق واقعی تصاویر لندست و مودیس. نشریه آبیاری و زهکشی ایران, 1394; 9(5): 710-719. یک روش برای تخمین تبخیر-تعرق واقعی خصوصاً در مناطق بزرگ، استفاده از روش سنجش از دور می­باشد. با توجه به این که برآورد تبخیر-تعرق واقعی با دقت تفکیک زمانی و مکانی بالا به طور همزمان برای بیش­تر سنجنده­ها از جمله مودیس و لندست ممکن نیست بایستی با استفاده از تکنیک­های ریز مقیاس کردن، تبخیر-تعرق واقعی به دست آمده از سنجنده­ای را به سنجنده­ای دیگر ریز مقیاس نمود. هدف این مطالعه استفاده از فاکتور مقیاس­های مختلف برای تمام پارامترهای ورودی به مدل سبال (ضریب آلبیدوی سطح، شاخص پوشش گیاهی و دمای سطح زمین) به طور همزمان، برای ریز مقیاس کردن مکانی تبخیر-تعرق واقعی به دست آمده از سنجنده مودیس با دقت تفکیک مکانی 1000 متر به تصویر لندست با دقت تفکیک مکانی 30 متر و هم­چنین استفاده از روش ورودی- خروجی رگرسیون بین پارامترهای همسان و روش ورودی- خروجی تفریق برای ریز مقیاس کردن زمانی تبخیر-تعرق واقعی تصاویر لندست از 16 روز به روزانه، در بخشی از دشت مشهد است. نتایج نشان داد که گسیلندگی سطحی در محدوده وسیع ( ) و دمای سطح زمین سنجنده مودیس به عنوان فاکتور مقیاس بهترین عملکرد را داشتند. شاخص پوشش گیاهی به عنوان فاکتور مقیاس در فصل تابستان و دمای سطح زمین سنجنده لندست به عنوان فاکتور مقیاس در فصل بهار عملکرد خوبی نداشتند. با توجه به یافته­های این پژوهش می­توان گفت که استفاده از گسیلندگی سطحی در محدوده وسیع ( ) و دمای سطح زمین سنجنده مودیس به عنوان فاکتور مقیاس، برای ریز مقیاس کردن مکانی تبخیر-تعرق واقعی و استفاده از روش رگرسیون- ورودی و رگرسیون- خروجی برای ریز مقیاس کردن زمانی آن در دشت مشهد نتایج مطلوبی به دست می­دهد. Remote sensing is a suitable method for estimating of actual evapotranspiration (AET) especially in large scales. As the estimation of AET with both high temporal and spatial resolution is impossible for most sensors such as MODIS and Landsat, it is necessary that the AET maps derived from a sensor were downscaled to another sensor using downscaling methods. The objectives of this study were to use of different scaling factors simultaneously for input parameters of SEBAL included surface albedo, normalized difference vegetation index (NDVI) and land surface temperature (LST) for spatial downscaling of AET maps derived based-MODIS (1000 m) images to Landsat images (30 m) and also temporal downscaling of AET maps derived based Landsat (16 day) images to MODIS (daily) images using input/output regression and input/output subtraction methods in a part of Mashhad plain. The results showed that the zero band emissivity of Landsat and LST of MODIS images had the best performance in spatial downscaling of AET maps. NDVI and LST of Landsat images as a scaling factor had not a good performance in spatial downscaling of AET maps in summer and spring, respectively. Considering the results of this study, it can be concluded that the zero band emissivity of Landsat and LST of MODIS images as a scaling factor for spatial downscaling of AET maps and input regression method for temporal downscaling of AET maps are suitable in Mashhad plain. Allen,R., Irmak,A., Trezza,R., Hendrickx,M.H., Bastiaanssen,W and Kjaersgaard,J. 2011. Satellite-based ET estimation in agriculture using SEBAL and METRIC. Journal of Hydrological Processes. 25:4011-4027. Almhab, .A and Busu,I. 2008. Estimation of evapotrnspiration with modified SEBAL model using Landsat-TM and NOAA-AVHRR images in arid mountains area, Second Asia International Conference on Modeling and Simulation, Kuala Lumpur, Malaysia. 13-15 May. Bastiaanssen,W.G.M., Noordman,E.J.M., Pelgrum,H., Davids,G., Thoreson,B.P and Allen,R.G. 2005. SEBAL model with remotely sensed data to improve water-resources management under actual field condition, Journal of Irrigation and Drainage Engineering. 131.1: 85-93. Bastiaanssen,W.G.M., Menenti,M., Feddes,RA., Holtslag,A.A.M. 1998. A remote sensing surface energy balance algorithm for land (SEBAL)-1. Formulation, Journal of Hydrology. 212-213:198-212. Bastiaanssen,W.G.M. 2000. SEBAL-based sensible and latent heat fluxes in the irrigated Gediz Basin, Turkey, Journal of Hodrology. 229:87-100. Braswell,B.H., Hagen,S.C., Frolking,S.E., Salas,W.A. 2003. A multivariable approach for mapping sub-pixel land cover distributions using MISR and MODIS: Application in the Brazilian Amazon region, Journal of Remote sensing Environment. 87: 243-256. Cammalleri,C., Anderson,M.C., Gao,F., Hain,C. R and Kustas,W.P. 2013. A data fusion approach for mapping daily evapotranspiration at field scale. Journal of Water Resources Research. 49: 4672-4686. Courault,D., Seguin,B and Olioso,A. 2005. Review on estimation of evpotranspiration from remote sensing data: From empirical to numerical modeling approaches, Journal of Irrigation and Drainage System. 19.3: 223-249. Famiglietti,J.S and Wood,E.F. 1995. Effects of spatial variability and scale on areally averaged evapotranspiration, Journal of Water Resources Research. 31.3:699-712. Franks,S.W and Beven,K. 1999. Conditioning a multiple patch SVAT model using uncertain time-space estimates of latent heat flux as inferred from remotely sensed data, Journal of Water Resources Research. 35.9: 2751-2761. Gao,Y., Long,D and Li,Z.L. 2008. Estimation of daily actual evapotranspiration from remotely sensed data under complex terrain over the upper Chao river basin in North China, International Journal of Remote Sensing, 29.11: 3295-3315. Gokmen,M., Vekerdy,Z., Verhoef,A., Verhoef,W., Batelaan,O., and Tol,C. 2012. Integration of soil moisture in SEBS for improving evapotranspiration estimation under water stress conditions, Journal of Remote Sensing of Environment. 121: 261-247. Ha,W., Gowda,P.H and Howell,T.A. 2013. A review of downscaling methods for remote sensing-based irrigation management, Journal of Irrigation Science. 31: 831-850. Hafeez,M.M., Chemin,Y., Van De Giesen,N and Bouman,B.A.M. 2002. Field evapotranspiration estimation in central Luzan, Philippines, using different sensors: Landsat 7 ETM+, Terra Modis and Aster. Symposium on Geospatial Theory, Processing and Applications, Ottawa. Hong,S., Hendrickx,J.M.H., Borchers,B. 2011. Downscaling of SEBAL derived evapotranspiration maps from MODIS (250 m) to Landsat (30 m) scales, International Journal of Remote Sensing. 32:6457-6477. Kaheil,Y.H., Rosero,E., Kashif Gill,M., McKee,M and Bastidas.,L.A.2008. Downscaling and forecasting of evapotranspiration using a synthetic model of wavelets and support vector machines, Journal of IEEE Transactions on Geoscience and Remote Sensing. 46.9: 2692-2707. Kustas,W.P., Li,F., Jackson,T.J., Prueger,J.H., MacPherson,J.I., Wolde,M. 2004. Effects of remote sensing pixel resolution on modeled energy flux variability of croplands in Iowa. Journal of Remote Sensing Environment. 92:535-547. Kustas,W.P., Norman,J.M Anderson,M.C., French,A.N.2003. Estimating subpixel surface temperatures and energy fluxes from the vegetation index-radiometric temperature relationship. Journal of Remote Sensing Environment. 85: 429-440. Kustas,W.P and Norman,J.M. 1996. Use of remote sensing for evapotranspiration monitoring over land surfaces, Journal of Hydrological Sciences. 41.4: 495-516. Liu,Y., Hiyama,T and Yamaguchi,Y.2006. Scaling of land surface temperature using satellite data: A case examination on ASTER and MODIS products over a heterogeneous terrain area. Journal of Remote Sensing. 105:115-128. Moran,M.S., Mass,S.J and Pinter,J.r. 1995. Combining remote sensing and modeling for estimation surface evaporation and biomass production. Journal of Remote Sensing Reviews. 12:335-353. Moulin,S., Bondeau,A and Delecolle,R. 1998. Combining agricultural crop models and satellite observations: From field to regional scales, International Journal of Remote Sensing. 19:1021-1036. Opoku-Duah,S., Donoghue,D.N.M and Burt,T.P. 2008. Intercomparison of evapotranspiration over the savannah Volta Basin in West Africa using remote sensing data. Journal of Sensors. 8: 2736-2761. Shahzad,S and Iftikhar,A. 2008. Determination of daily regional scale actual evapotranspiration for Indus sub basin using Landsat ETM+, Pakistan Journal of Meteorology. 4.8:49-58. Shuttleworth,W.J. 2007. Putting the “vap” into evaporation. Journal of Hydrology and Earth System Science. 11.1: 210-244. Singh,R.K., Irmak,A., Irmak,S and Martin,D.L. 2008. Application of SEBAL model for mapping evapotranspiration and estimating surface energy fluxes in South-Central Nebraska. Journal of Irrigation and Drainage Engineering. 134.3: 273-283. Stathopoulou,M and Cartalis,C. 2009. Downscaling AVHRR land surface temperature for improved surface urban heat island intensity estimation, Journal of Remote. Sensing Environment. 113:2592-2605. Tasumi,M., Allen,R.G., Trezza,R. 2006. Calibrating satellite-based vegetation indices to estimate evapotranspiration and crop coefficients. In: Wichelns D, Anderson SS (eds) Proceedings of the 2006 USCID water management conference, groundwater and surface water under stress: competition, interaction, solutions, published by USCID, Denver, Co, USA. Tasumi,M., Trezza,R., Allen,R.G and Wright,J.L. 2003. U.S. validation tests on the SEBAL model for evapotranspiration via satellite, ICID Workshop on Remote Sensing of ET for large Regions, 17 Sept. Teixeira,A.H., Bastiaanssen,W.G.M., Ahmad,M.D and Bos,M.G. 2009. Reviewing SEBAL input parameters for assessing evapotranspiration and water productivity for the Low-Middle Sao Francisco River basin, Brazil, Part A: calibration and validation, Journal of Agriculture and Forest Meteorology. 149: 462-476. Timmermans,W.J., Kustas,W.P., Anderson,M.C., French,A.N. 2007. An intercomparison of the surface energy balance algorithm for land (SEBAL) and the two-source energy balance (TSEB) modeling schemes, Journal of Remote sensing Environment. 108: 369-384. Tukimat,N.N., Harun,S and Shahid,S. 2012. Comparison of different methods in estimating potential evapotranspiration at Muda Irrigation Scheme of Malaysia. Journal of Agriculture and Rural Development in the Tropic and Subtropics. 113.1: 77-85. Wu,H., Li,Z.L. 2009. Scale issues in remote sensing: a review on analysis, processing and modeling, Journal of Sensors. 9:1768-1793. Yang,F., White,M.A., Michaelis,A.R., Ichii,K., Hashimoto,H., Votava,P., Zhu,A.X., Nemani,R.R. 2006. Prediction of continental-scale evapotranspiration by combining MODIS and AmeriFlux data through support vector machine. Journal of IEEE Trans Geosci Remote. 44: 3452-3461.